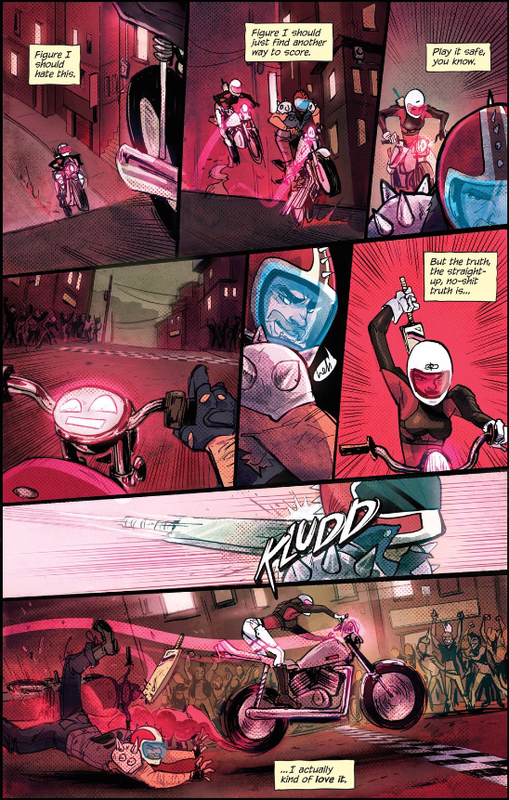 Today, Drew and Ryan M. are discussing Motor Crush 1, originally released December 7th, 2016. As always, this article contains SPOILERS. Drew: I’ve been thinking a lot recently about story structure, and particularly Dan Harmon’s distillation of the hero’s journey. Joseph Campbell’s monomyth was designed to be as general as possible, so that it might be applied universally, but Harmon takes it a step further, stripping away specifics like “the belly of the beast” and “death and resurrection” to land on an ordered set of eight words: You, Need, Go, Search, Find, Take, Return, and CHANGE. Harmon explains all of those in greater depth, but for the purposes of this discussion, I’m interested in the first two: you (establishing a protagonist in a zone of comfort) and need (establishing a need for the character that might draw them outside of that zone of comfort). I’m used to that opening quadrant of the “story circle” — the quadrant that ends when the character leaves their zone of comfort — being relatively small, moving on to the meat of the journey quickly. 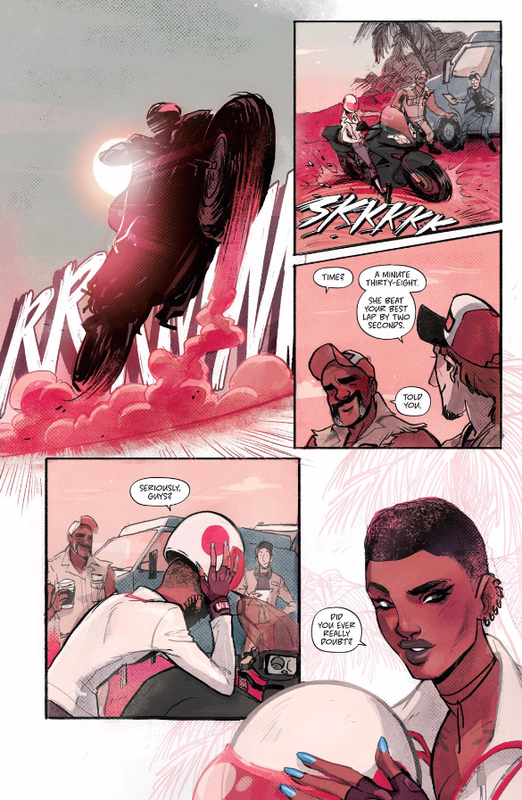 That’s definitely the case with Motor Crush 1, which pushes its protagonist out of her comfort zone so quickly, I’m honestly not sure what “normal” looks like for her. I think part of the problem is the near-future sci-fi setting, where the world is just different enough for us to not be able to take normalcy for granted. For a story set in the modern day, it’s easy enough for the audience to fill in that information themselves — knowing that the protagonist is a suburban teenager or a middle aged stockbroker is enough to make an estimated guess as to what their lives are like. The ability to make those guesses completely breaks down in sci-fi stories, where the character’s zone of comfort may not share any frame of reference with our own. A nuanced, detailed portrait of “normalcy” needs to be established, or our own discomfort with the setting gets projected on the protagonist, undermining our understanding of what change would even mean for them. Actually, they goose our anticipation of her arrival with a page where everyone is talking about when she’s going to get there. It’s remarkably effective as an opening two pages. Unfortunately, this isn’t a full portrait of what normalcy is for Domino. First, we learn that she’s being funded in part by livestreaming her life via drones, which also tells us that motorbike racing is so popular as to warrant reality TV contracts. 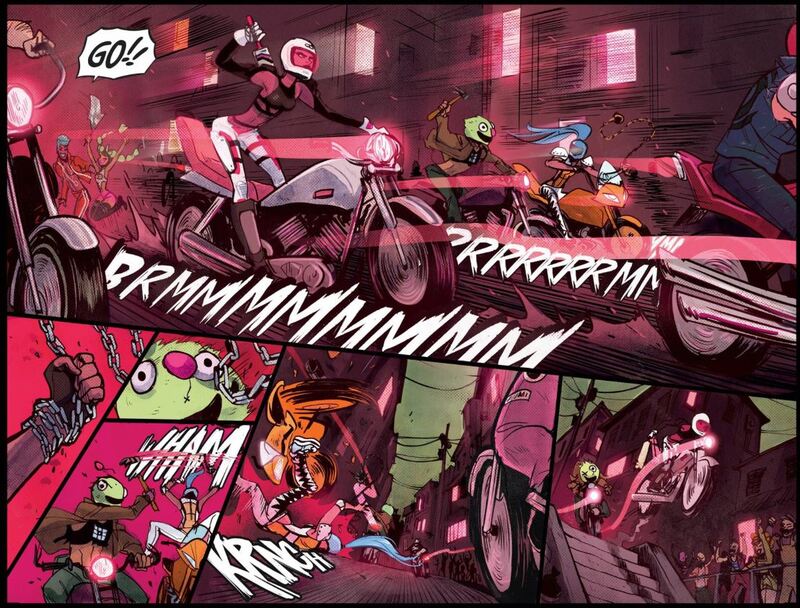 Then, we learn that Domino is secretly doping, and that she acquires her drugs by winning illegal street races. The problem is that we never really understand what Domino’s goals are. That she would risk getting caught both racing illegally and taking performance-enhancing drugs suggests that she cares a great deal about being a successful professional racer, but she never expresses anything to that effect. Indeed, the biggest insight into what her desires are suggests that she’s actually more into the illegal racing than she is the legal kind. Or, at least, she expresses that she loves illegal racing, but remains more or less silent on her enjoyment of legal racing. Does she care about the Grand Prix circuit, or is she just doing it to appease her dad? Does she feel guilty about using these drugs? Exactly what is the risk of her being caught? This situation is full of possibilities, but they’re left frustratingly unexplored, which leaves my understanding of who Domino is completely on the surface. 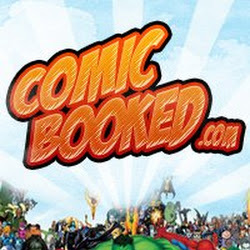 A superficial familiarity with the protagonist might be okay for the first installment of an ongoing series — you can only go into so much depth in one issue — but we’re then expected to sympathize with her motivations when her drugs are stolen. What do these drugs even do? What happens if she stops taking them? Is she even any good without them? Without answers to those questions, I just have to accept that Domino would then risk breaking into a drug kingpin’s casino to steal her drugs back. Maybe the desperation of that action is characterization in and of itself, but it’s when that plan goes awry that I really lose the thread. Cornered by the kingpin’s men, and with most of the drugs destroyed, Domino apparently opts to overdose to avoid the repercussions. What were the repercussions? Without understanding her hopes and fears, the suicide attempt feels completely hollow — drama for the sake of drama. We don’t have enough information to understand the desperation of her choice, which, combined with our knowledge that Dom is likely going to be around for issue 2, makes her actions feel incredibly cheap. This isn’t suicide; it’s a cliffhanger. Ryan, I really loved this creative team on Batgirl, so I’m inclined to give them the benefit of the doubt, but this issue was a big miss for me. Did you have as much trouble with getting inside Dom’s head as I did, or did you finding characterization in places I didn’t? Or maybe the racing sequences made up for those defecits — I was so focused on Dom that I completely failed to mention how great those sequences are. Ryan M: Yes, the racing sequences are great and build the world at a pace that feels more manageable than the plot which speeds by. The street race is engaging and fun. We get stats and headshots of our riders and then get to see them in action. The race begins with the page above. It’s a cacophony of action and movement. The riders are in battle positions, raised up off their seats, weapons in hand. Just seeing this race, I feel like I understand both what that world is and why Dom is attracted to it. She is a beast among beasts. Adding to the drama of the top panel above is the pink light emanating from the headlights. While that may not be a result of Crush use, it certainly is evocative of that little pink vial that is both a prize and a necessity for this race. Which brings me to my biggest qualm with the issue, the drug at the center. Drew, I agree that Domino is hard to know or understand in this issue. Her life spins out of control very quickly and we don’t even get to live in that with her before she gives us and drinks the pink stuff. We don’t know why she is hoarding the vials. She’s only won 17 races, and it’s not clear if she dopes her bike for that opening race in which she beats her dad’s time or if she is saving them for the WMR. Crush is introduced as a performance enhancer for your bike. It’s also called addictive, at least by the news ticker at World Grand Prix. This is in itself a fairly interesting concept. Getting dependent on the high you give a machine? I wanted to see that in action. Supercharging your tools is not a new concept in sports, but I’ve never heard anyone claim that corking your bat is addictive. 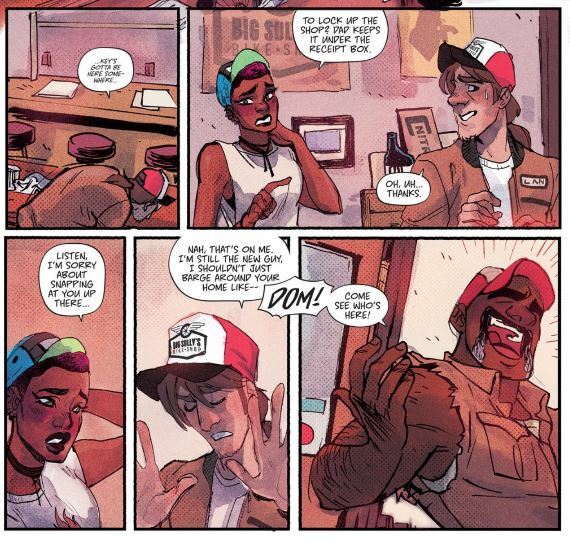 Crush is so central to Dom’s motivations in the issue, it feels like a loss that we don’t understand it more. The time spent at Big Sully’s Bike Shop worked for me in terms of character insight. Dom’s playful banter with her old friend and both of their willingness to turn animosity on and off for the cameras was almost sweet and showed that Dom has some self-awareness. The scene starts with Dom coming downstairs unsure if Lan had seen her stash. Dom is blushing and awkward as she talks to Lan. It’s a very brief conversation, but the embarassment they share here felt more authentic than much of the bravado that Dom expresses later in the issue. Then again, she doesn’t seem to care that much that he is killed in a Crush-combustion in front of her eyes. This takes us back to the Crush and what it means to her. She is willing to put aside her basic humanity to make finding Crush her mission. I am not sure if the narrative is stronger should Dom’s suicide attempt be successful, partially because I’m not sure what the narrative is here. The first page of the issue has a countdown clock along the right side. We have eight days until the World Grand Prix in Nova and, while I would be interested in reading more about it, I don’t care too much one way or another if Domino is competing.